In Rhode Island, we are not accustomed to thinking of any storm much smaller than a hurricane as a potential danger. However, in one week this summer, the state experienced 2 severe storms, including a tornado warning, flooding, and wind damage that left thousands without electricity. In nearby states, recent storm systems took the lives of several who were caught in them. We want you to be prepared in advance for severe storms, and to know how to respond in a storm, so that you and your family are safe when the next severe storm hits. Severe Weather Watch vs Warning. When a severe storm watch has been issued for your area, that means that a strong storm might develop nearby. Whether you are home, on the road, or outdoors, you should monitor the weather during the watch period, and have a plan ready in case of a storm. If a warning is issued for your area, then a severe storm is approaching and you should follow your storm plan and seek shelter immediately. Before storm season starts, make sure that your trees are well trimmed and maintained to help reduce the likelihood of falling branches. If a tree expert tells you that a tree or large limb is close to structures, power lines or roads and may be vulnerable to high winds, you should consider taking it down. Keep your home’s (or business’s) exterior in good repair, especially roofing and flashing, windows and doors, foundations and gutters. This lessens the possibility of wind damage or leakage in a heavy rain. Know whether your home or workplace is in a flood zone and be aware of roads that are likely to flood along your route in a heavy rain. The Rhode Island Emergency Management Agency’s (RIEMA) Floodplain Mapping Tool can help you learn more. Have emergency kits and an emergency plan in case the storm causes an extended outage like the August 4th storm, or damages your home enough that you are forced to evacuate. Both the Red Cross and RIEMA offer emergency preparation how-to’s on their websites. Discuss thunderstorm and lightning safety with your household and make everyone familiar with the family emergency plan if a storm hits. If your family uses cell phones, find out if your carrier is part of the Wireless Emergency Alert system which will send a text alert in the event of a weather emergency (read more here). The National Weather Service also has a listing of third party weather alert services. Both at home and your business, before any storm approaches, put away outdoor items that might carried away in high winds such as umbrellas and lawn furniture, toys, and any yard and garden equipment or display material that is stored outside. Make sure your windows and doors can be closed and secured quickly. If you have planned a day outdoors, it’s even more important to reconsider your plans in light of the warning. The last place you want to be in a severe storm is out on a boat, a fair ground, a golf course, a hiking trail, or any outdoor spot far from shelter. No picnic or golf game is worth the risk of a lightning strike, or being caught in large hail, or destructive winds. On the water, you have no shelter from lightning and wind driven waves can even swamp or capsize your boat. This means that a storm is approaching quickly. Follow your storm plan and seek shelter immediately. If you are outdoors, get inside a sturdy building as quickly as you can (But remember, metal structures and open structures such as picnic shelters are not safe.) Make sure to have everyone in the household and all pets come inside with you. Head for an inside room on the lowest level of the building, away from all windows, and stay there until the storm has passed. During the storm, stay away from plumbing fixtures and any electrical devices that are plugged in. 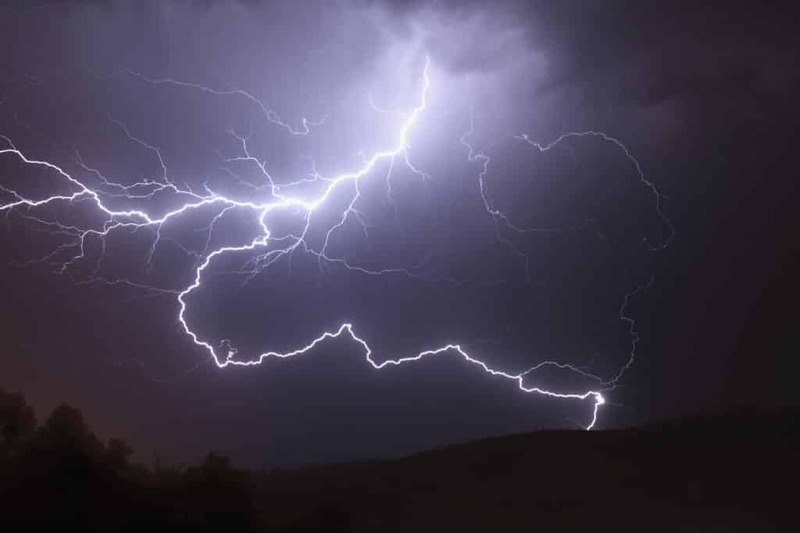 If lightning strikes the building, it can travel through both electrical wiring and plumbing. Remember, if you can hear thunder, you can be struck by lightning, even if the sky seems clear. Wait until the storm has completely passed and the thunder and lightning have stopped before going outside. If someone is injured by lightning or falling debris, call 911 immediately. Give first aid while waiting for help but do not try to move a seriously injured person, unless they are in imminent danger. Before you go outside, check for tree branches or other structures in danger of falling nearby, and especially, look out for downed utility wires. If wires are down, do not approach them or touch anything that is touching them. Call 911 and National Grid to alert them of the downed lines. If your building has been severely damaged by wind, falling trees, hail, lightning, or is in the path of flooding, follow your evacuation emergency plan and get yourself and your family to safety. When you are cleaning up after a storm, wear protective clothing, sturdy shoes and gloves and safety goggles, and watch for nails, broken glass and other sharp objects. Do not try to use chain saws or other power tools to clean up, unless you are sure you know how to use them safely. You can find much more information on storm safety and preparedness at RIEMA and the Red Cross. We hope you have a safe and sunny summer. Rob Levine & Associates specializes in Personal Injury throughout Rhode Island, Connecticut and Massachusetts, as well as Social Security Disability and Veterans Disability throughout the country. As “The Heavy Hitter®” Rob Levine not only works hard on your case, but also believes in making a positive impact in the communities he serves. Through internal resources, education and volunteerism, Rob Levine & Associates strives to help prevent accidents, as well as raise awareness around the needs of our elderly and returning veterans. For more information visit www.roblevine.com, or call 401.529.1222 or toll free 800-529-1222.